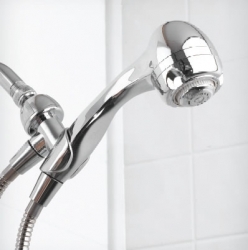 Niagara Earth® Massage Handheld Showerhead- Save On Utility Bills! This water-saving hand-held showerhead uses a non-removable flow-compensator to guarantee a feeling of great force while using a maximum of 1.5 gallons per minute (GPM). The non-aerated 9-jet turbo massage is adjustable, ranging from a gentle needle spray to a forceful jet. It will deliver a consistent flow rate regardless of the water pressure. ABS thermoplastic body with a 72" hose. I purchased the Niagara Earth Massage for home use. After using this unit once, I learned I have found a winner. I have well water and the pressure isn't that great, but this unit stabilizes the pressure almost to the point to where you see no flow change. I own a few rental properties and purchased this unit for one rental and she just loves it. I have ordered 4 of them and plan on ordering more. Great unit, and it saves water.